Multi-vehicle accidents are more complex not just because there are more vehicles involved, but also because they typically involve more than one contributing factor, such as weather, road conditions, following too close or unexpected braking from other drivers. In addition, more vehicles means more passengers and drivers involved with a greater number of potentially serious injuries. Missouri is an at-fault state that uses a pure comparative fault system. This simply means each driver involved is responsible for any part of the accident he or she caused. In a multi-vehicle accident, typically there are multiple responsible parties. Fault does not always lie with the one who caused it or started the chain reaction. Let’s take a look at the following example. Vehicle 1 is stopped at a red light. Vehicle 2 is stopped behind Vehicle 1. Vehicle 3 rear-ends Vehicle 2 who then crashes into Vehicle 1. It was determined that Vehicle 2 was too close to Vehicle 1 so, in this case, both Vehicles 2 and 3 share in the fault of the accident. Vehicle 1 may file a claim against Vehicles 2 and 3; and Vehicle 2 may file a claim against Vehicle 3. In this simplistic example, the drivers of Vehicles 2 and 3 will be assigned a percentage of fault in the accident, say 30% and 70% respectively. Assigning a percentage of blame is not an exact science, however, which is why it is a good idea to have a personal injury attorney involved who understand the details of the accident and how the process works. Seriously Injured in a Multi-Vehicle Accident? Conduct an investigation to determine how the accident occurred. Gather evidence from the scene, obtain police reports and witness statements. Employ experts such as someone to do an accident reconstruction. Write up a demand letter that is supported by all exhibits to prove your claim. Time to Obtain LEGAL ASSISTANCE? 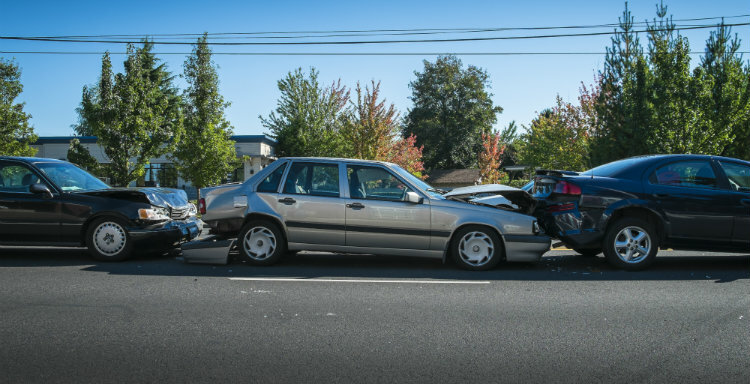 When you have been seriously injured in a multi-vehicle accident, contact the Nash & Franciskato Law Firm for a free, no-obligation review of your case.